When you add a new text block or image to the ticket, it will be top-most and cover or overlap all other text blocks and images previously entered. To bring a covered text block or image to the top and cover or overlap all other entries, just click to select it. If you have overlapping text blocks and images, it can become annoying if the layer order changes each time you click an object to edit, resize, or position it etc. 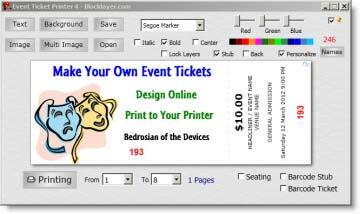 Once you have all the text blocks and images on the ticket in the correct layer order, check Lock Layers to lock the current layer overlap order, and prevent objects being brought to the top when selected for editing. 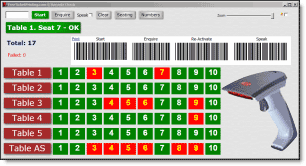 Uncheck 'Lock Layers' to click and re-order the objects in the ticket. If images have large empty (white) margins, crop the image before adding to the Ticket, so the margins don't cover nearby objects.